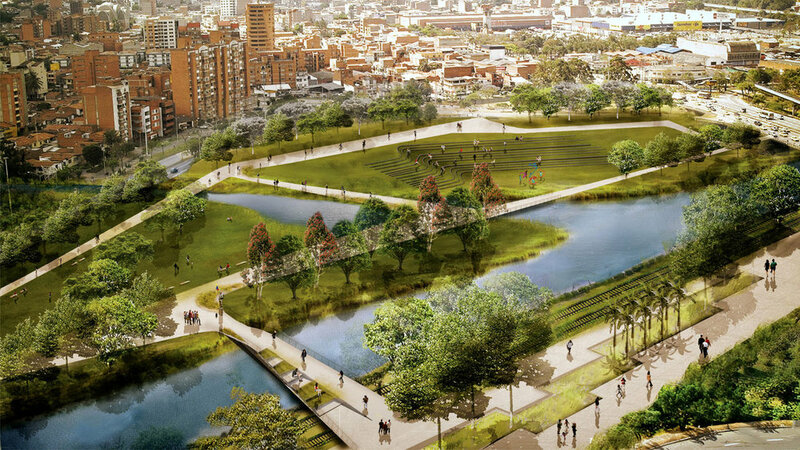 Corkery Consulting in association with Diana Wiesner Arquitectura y Paisaje (Bogota) and architect and urbanist Gustavo Restrepo (Medellin), prepared a master plan concept for the River Park through the centre of Medellin, Colombia in an international design competition. 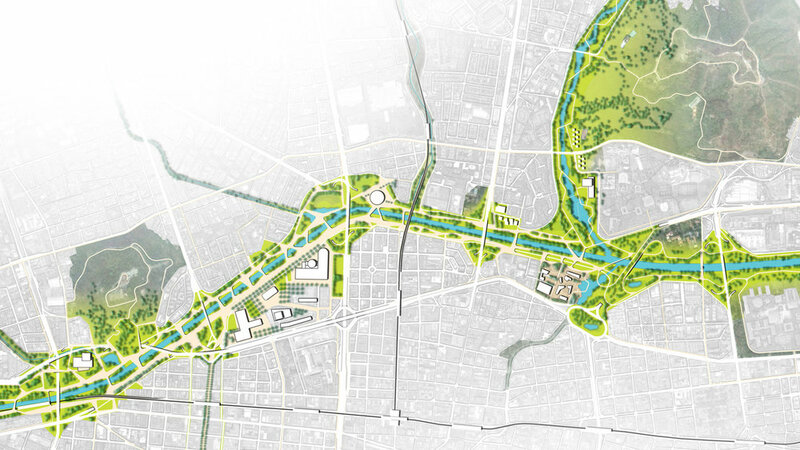 The concept builds on the opportunity to recover public spaces along the river corridor, leaving the current use of the Aburrá River as a median of the highways running through the city. It integrates hydrological, ecological and social values to create a new braided urban form within this broad valley. The structuring of Aburrá Valley ecological corridor begins with restoration of the riverbed by removing the concrete lining and the hydraulic condition of the network of drainage lines that define the whole city. The idea is to create a sustainable urban drainage system that allows retention and mitigation of floods, mainly in the areas with extensive paved surfaces and buildings. In turn this hydrological mesh is integrated with the public open space network to increase connectivity and enhance the experience of play, socialising, exercise and learning. the creation of a large north-south open space corridor, connected to a network of drainage lines forming linear green corridors. The concept would create a diverse, flexible and adaptable system of open spaces and ecological corridors that are connected to all parts of the city. A series of new lakes create new recreation opportunities, address flooding, improve the micro-climate and provide aesthetic delight. Development of the lakes is integrated with redevelopment of existing industrial land to new residential and employment land uses. which to recover common values f coexistence in a friendly environment. Within this new environment the different socio-economic areas of the city are projected and various activities related to the character of each site. At the same time they facilitate the interaction of the whole population. Citizens can find across the river corridor network a wide range of places to play, work, walk, cultivate, buy, sail, study, travel, rest, learn, celebrate and relax.